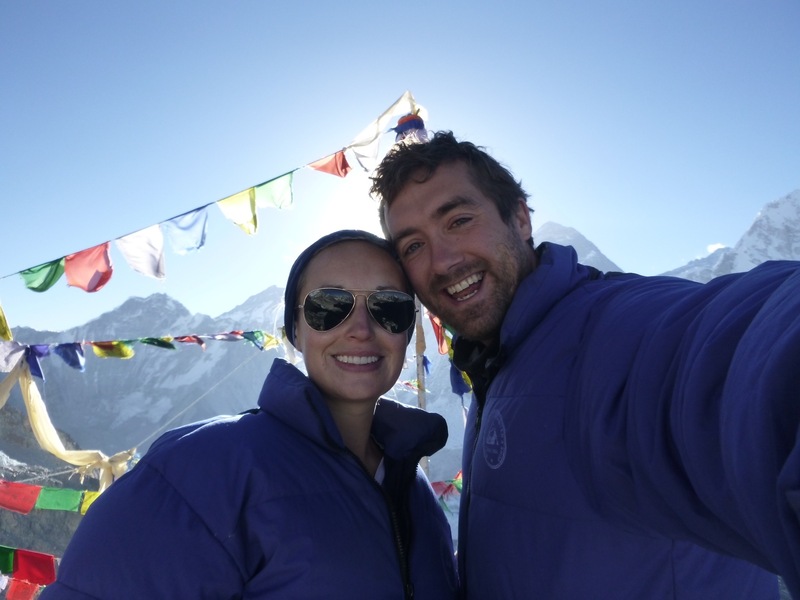 Today was the big day – we would hopefully make it to Base Camp. We woke up extremely early and had breakfast 5:30AM in the semi darkness. We managed to throw everything into the backpack and our porter started off ahead of us as usual. 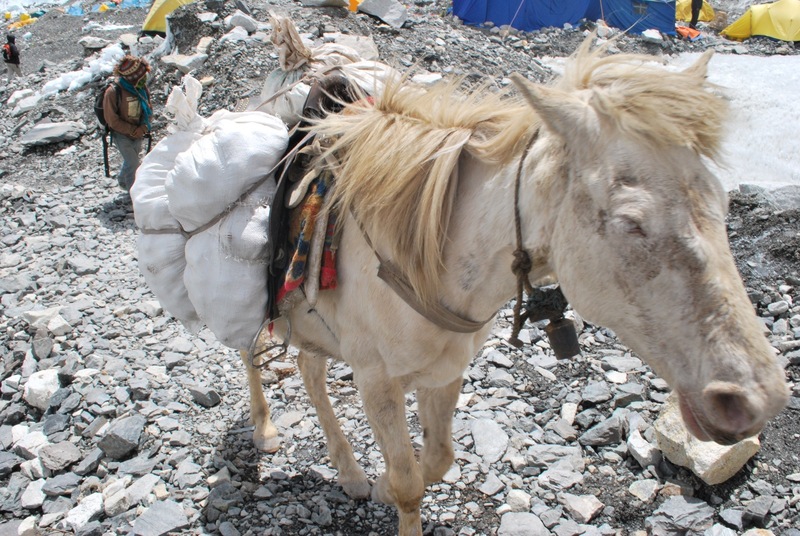 Today we would walk the 4 hours to Gorak Shep, have an early lunch, then make the round trip to Base Camp. We forced down our omelettes and set off. It was bloody freezing at first due to the early hour and also the altitude, we were now really high up so the landscape was barren as it is too cold for anything to grow. We both wore our down jackets, gloves, hats and anything else that could keep us warm. The way to Gorak Shep was less steep than other days had been, but the lack of oxygen made it pretty tough nonetheless. We pretty much kept our heads down and ploughed on, gasping for breath anytime we went uphill. We arrived at Gorak Shep around 9:30AM and ordered lunch. We were really not hungry but knew we needed energy for the next part of the adventure. We had some noodles and tea, refilled our water bottles and were ready to go! 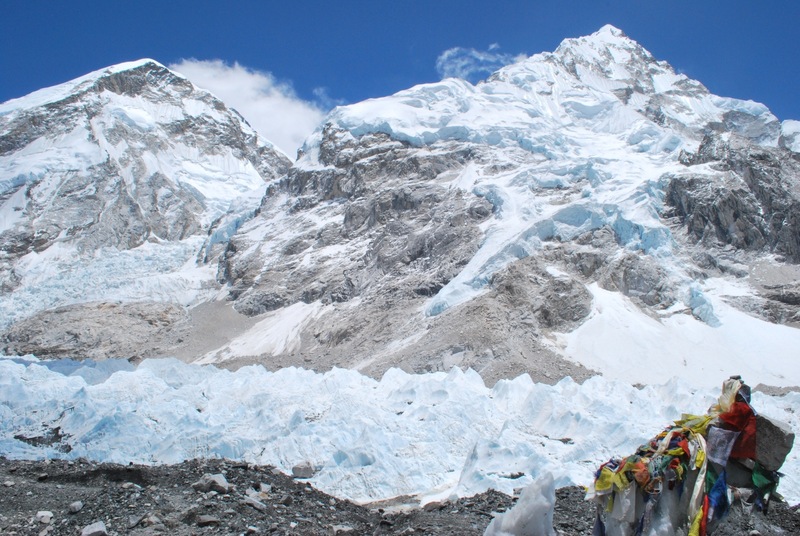 The first part of the walk to Base Camp is pretty flat and takes you alongside the Khumbu glacier. Dust and dirt covers a lot of the glacier meaning it only becomes apparent what it is when somebody points it out to you. This stretches on for a long way from Gorak Shep towards Base Camp. Eventually we rounded a corner and we could actually SEE it. Finally! 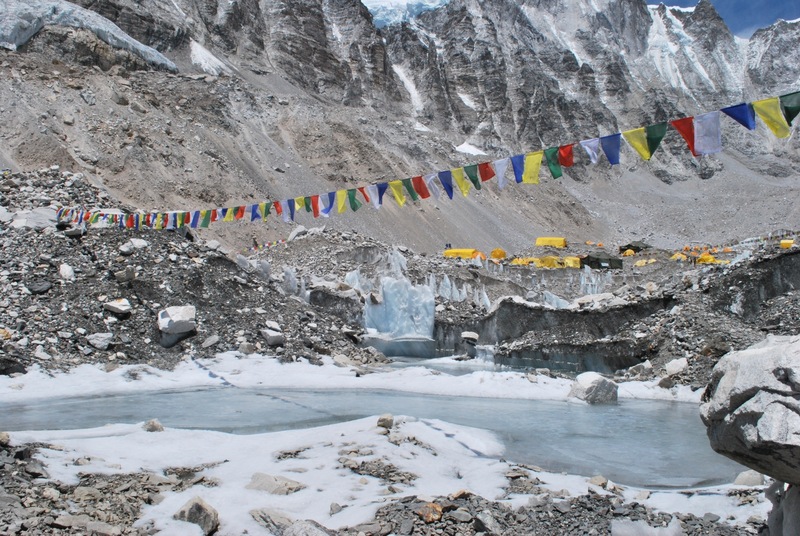 A monument with prayer flags marks the entrance to Base Camp and behind this is Base Camp 2 where you can see different collections of tents belonging to the various expeditions. 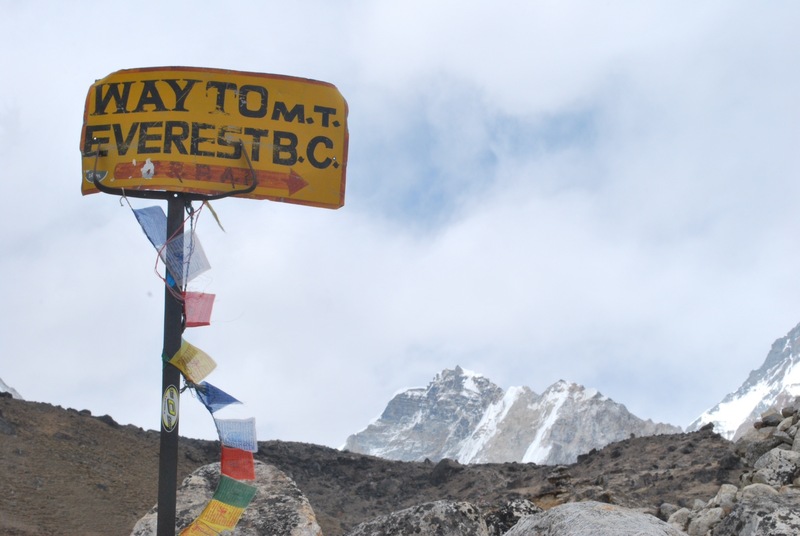 We kept pushing forward, the sight of Base Camp spurring us on and after another 40 minutes we had reached the entrance complete with signs to pose next to! 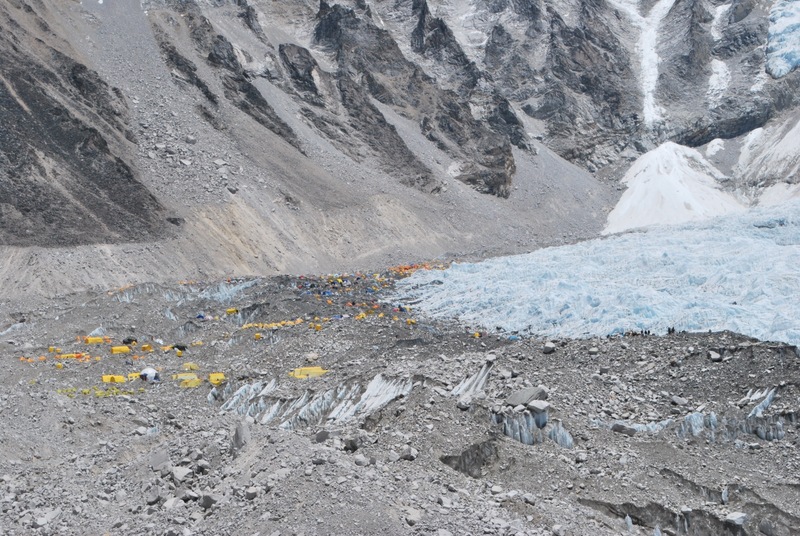 We sat down for a while and took some photos before heading in a bit further towards Base Camp 2 where we would find all of the expedition tents. This was another 20 mins walk and we bumped into some guys we had met who were trying to make it to the summit. 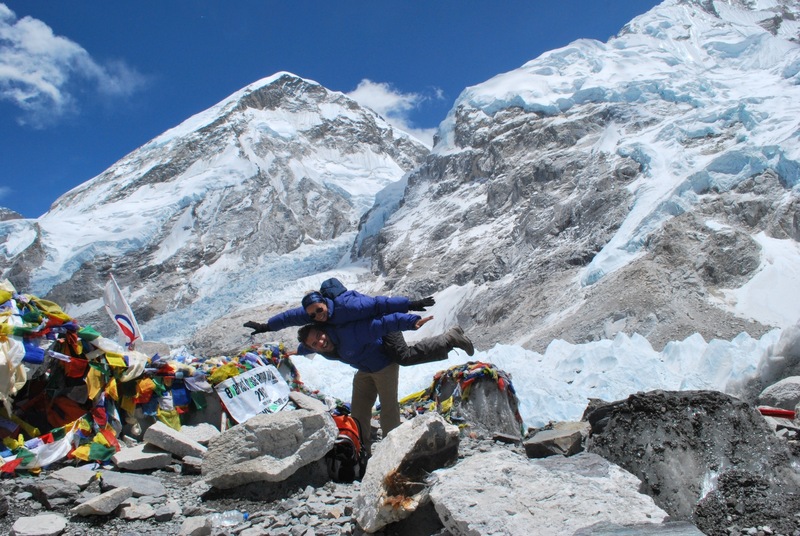 We wished them good luck as they made their way to their tents ahead of a climb to camp 3 in the next few days. After a few more photos we decided to head back to Gorak Shep. It took us another 2 and a half hours to get back, as soon as we reached the lodge we went to our room and crawled into our sleeping bags. We just about managed some dinner around 6PM and then went straight to bed as we had an even bigger day the next day – a 5AM walk up to Kala Pattar and then a hike back down to Pheriche or Pangboche. Who said this was a holiday? !